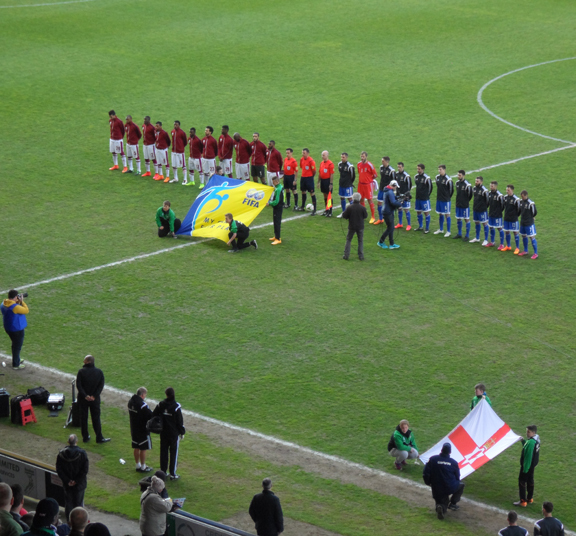 On 31st May 2015 just before 5pm the senior men’s football teams of Qatar and Northern Ireland took to the pitch of the Alexandra Stadium in Crewe. 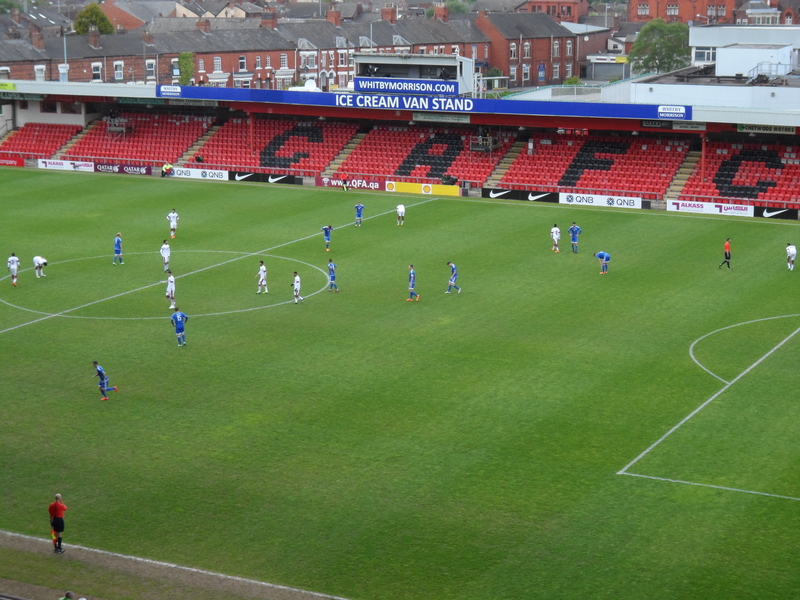 It was an out-of-season friendly match with no real significant meaning, other than giving both teams a run out before bigger games in June. Northern Ireland face Romania in a European Championship qualifier on June 13th and Qatar begin their 2018 World Cup qualifying attempt against Maldives on June 11th. It was an interesting experience being part of the 3,022 fans who gathered to witness the occasion which ended as a 1-1 draw. Before a ball was kicked I was pleasantly surprised by two things. Northern Ireland (called the Green & White Army) being officially the away side, came out wearing their royal blue away kit whilst Qatar had their usual white strip with maroon flash. Not being aware of the Northern Irish away colours I was a little taken aback and my surprise heightened as the national anthems’ struck up. All the fans rose to their feet (so I scrambled to mine) and sang with pride and gusto God Save the Queen. They politely stood for the Qatar anthem as well and respectfully applauded after. I’ve NEVER been or seen a game where that has happened before, I can usually discern the odd heckle somewhere. Well done Northern Ireland fans who undoubtedly made up the crowd, although I did make out about half a dozen Qatar jacketed people in a small cohort near to where I was sitting. First Half Action: Northern Ireland seemingly using a 4-1-3-2 formation had virtually all of the possession, with Qatar being completely unable to get any quality balls into the final third. As a result the Northern Ireland keeper Roy Carroll had NOTHING to do at all whilst Qatari keeper Armine Lecomte earned his keep, dealing with at least four efforts to encroach his goal. Both Northern Ireland front men Grigg and McGinn were involved and McGinn had by far the best chance. Qatar lined up with a 4-3-3 formation which morphed seamlessly into other permutations including 4-1-3-2 during the game. Although the changes appeared to develop naturally through game planning, the Qatari’s just couldn’t get the ball to any player pushing forward. I wondered if it was a lack of communication between the defence and midfield and yet when left back Yasser surged forward, midfielder Elsayed fell back instantly to defence and Ismail and Mohamad slotted into the midfield wing positions. Qatar had goal scoring potential throughout their squad but there was no evidence of this at all, as they could barely get the ball out of their own half. Was the less than ideal playing surface a factor, or the Northern Ireland pace, momentum and zeal the real problem? Second Half Action: Northern Ireland made one substitution at the break bringing on Michael McGovern in goal. They were on the pitch a good four minutes before the Qatar team appeared to recommence the match. Instantly Northern Ireland began the attack surging down the right wing. At the far corner flag McGinn brought the ball inside to be nearer the edge of the box, chipped the ball over the heads of the hapless Qatari defence, thus enabling Stuart Dallas from four yards out to head the ball home on 46 minutes. Northern Ireland now in the lead continued to show their dominance, but multiple substitutions by Qatar near the midpoint of the half ruffled Irish feathers a bit. At least four new players for Qatar came on virtually all at once and within minutes the game was equalised. Boudiaf from around the 23 yard mark launched a screamer into the top corner of McGovern’s net, having been supplied by a beautiful cross from Asadalla in midfield. In my opinion the game was equalised on 70 minutes and not 75 minutes as I’ve seen reported elsewhere. There is no official time clock at the Alexandra Stadium but I had just completed my commentary of the third quarter of the game, and handed over to my colleague for the last twenty minutes. Qatar were a different team after the changes and created a couple more chances to score, Muntari’s effort glancing over the crossbar and McGovern scrambling for a ball delivered from a low powerful free kick by Al Haidos. These two chances were the only time Qatar actually got the ball into the Irish 18 yard box with other efforts coming from distance. Although the Northern Ireland team made major changes before and after the equaliser, they were not quite the same force against a resurgent Qatar side. Near the end Jonny Evans could have won it for Northern Ireland but his effort went wide. Worryingly Evans had gone down earlier with an apparent leg injury but had run off the effects by full time. And Magennis seemed none the worse for having landed head first over the advertising hoardings in the last four minutes of time. My Thoughts: The game was a pleasantly sedate affair with only a couple of meaty tackles during the whole match. Qatar played with a quality and naivety that was devoid of cynicism and many would describe this as not having the technical ability to close the game down. But I quite like the innocence in play, and I was reminded of the same trait being shown by the oriental teams in the 2010 World Cup (Japan, South Korea, and North Korea). And to give Qatar credit, having scored in this game means they have failed to score in only one of fifteen games over the past ten months. That is a track record I imagine Northern Ireland and many other teams might like! The predominance of advertisements for Qatar around the pitch told the tale that the game was being shown in the Gulf state. 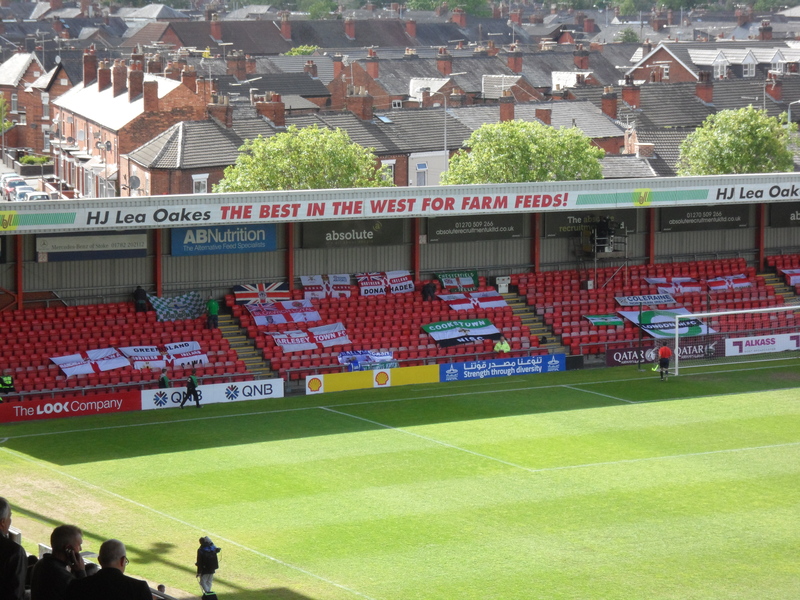 This was offset by the Northern Irish flags on the terraces making a weird visual combination! The match was less frantic than the fight for survival league games the Alexandra Stadium normally host, so I was able to think for a change. I enjoyed the bustle of the Northern Ireland team, their good possession of the ball and seeing some familiar names. The crowd were in terrific voice, although I wasn’t aware of what they were actually singing or chanting and the sound of a steady drum throughout was like a heartbeat for the game. It was a lovely atmosphere to experience and I know that the St John’s Ambulance volunteers and stewards share my viewpoint, how we wish that every week could be like that in the home of Crewe Alexandra FC. My only gripe about the match concerns matters away from the pitch. Whoever decided that a souvenir program was NOT NEEDED is an idiot. Many of us would have happily paid for a memento of the match, and a combined issue covering the Scotland friendly on June 5th would have been greatly appreciated. It was surreal watching a team that we knew nothing about and a program fleshing out some of the Qatari players would have helped (and been a good PR move). Northern Ireland: GK Carroll (McGovern 46), RB McLaughlin, Cathcart, Hughes (J Evans 61), LB Lafferty, McNair (Magennis 82), Norwood, C Evans, Dallas (Boyce 73), F Grigg (McCourt 73), F McGinn (Ward 61). My Men of the Match: Northern Ireland’s McNair for his tireless work linking the defence and midfield and Qatar’s Asadalla for his immediate impact on the game and changing his team’s fortune.